SleepDri ® Underpads are the most cost-conscious bedding protection you can buy. Its top layer is fabric-soft, while moisture passes through to a super absorbent inner layer. Well crafted quilted design uses a high-quality polyester/rayon blend for fast wicking and moisture retention. The bottom layer is 100% waterproof, with a non-slip surface. Soft quilted top layer wicks away moisture . Super absorbent inner layer traps fluid. 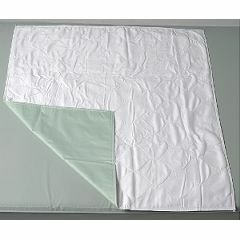 Waterproof vinyl/polyester back sheet prevents slipping. SleepDri ® Underpad withstands repeated laundering without fraying or shrinking. Quick-drying and stain-resistant, easy on your budget and its much kinder to the environment than disposables. AllegroMedical.com presents The SleepDri Underpads. SleepDri ® Underpads are the most cost-conscious bedding protection you can buy. Its top layer is fabric-soft, while moisture passes through to a super absorbent inner layer. Well crafted quilted design uses a high-quality polyester/rayon blend for fast wicking and moisture retention. The bottom layer is 100% waterproof, with a non-slip surface. Soft quilted top layer wicks away moisture . Super absorbent inner layer traps fluid. Waterproof vinyl/polyester back sheet prevents slipping. SleepDri ® Underpad withstands repeated laundering without fraying or shrinking. Quick-drying and stain-resistant, easy on your budget and its much kinder to the environment than disposables.